TACOMA, Wash. – A man suspected of fatally shooting a veteran Tacoma, Wash. police officer was shot and killed by authorities early Thursday after an hours-long standoff in which he was using two children as shields, reports CBS affiliate KIRO. The 45-year-old officer was killed after responding to a domestic violence call around 5 p.m. on Wednesday. 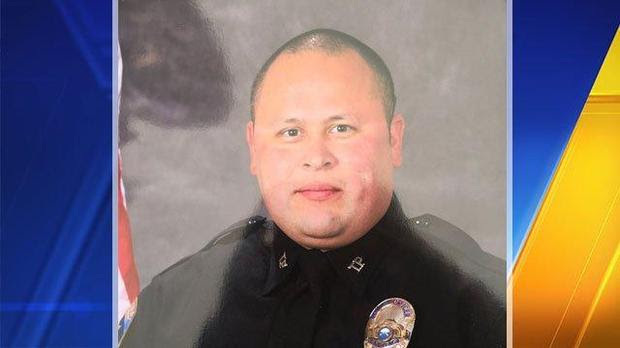 The fallen officer, Reginald “Jake” Gutierrez, had served with the department since 1999 and was highly respected and experienced, Tacoma Police Chief Donald Ramsdell told reporters Thursday. Ramsdell said the incident began Wednesday afternoon when animal control officers working near the house were approached by a woman who said her husband had locked her out and taken her phone. The officers called police. Gutierrez and his female partner went into the home, and Gutierrez was shot multiple times as he reached the top of the stairs to speak with the suspect, Ramsdell said. The female officer fired back and ran from the house, taking the wife to safety. Tacoma police spokeswoman Loretta Cool described the hectic scene that led to the standoff. “We had an officer down and shots still firing at the time,” Cool said. Police managed to get the officer out “but they were still taking fire,” she said. Kristi Croskey, who rented the home to the suspect and his wife, was inside the home at the time and barricaded herself in the bathroom before she was able to escape, KOMO-TV reported. “They said they just wanted to talk to him and then gunfire started, they didn’t start it,” Croskey said. At about 9 p.m., Cool said Gutierrez, who had been rushed to a hospital to undergo surgery, had died. The standoff continued overnight until about 3:30 a.m. Thursday, when the suspect, a 38-year-old man, was reportedly fatally shot by a Pierce County deputy.